Johann Sebastian Bach (1685-1750):	 Aria: "Stein, der über alle Schätze"
Johann Sebastian Bach:	 Aria: "Ich säe meine Zähren"
Reinhard Keiser (1674-1739):	 Kantate: "Laetatus sum"
Johann Sebastian Bach:	 Aria: "Seele, deine Spezereien"
Georg Böhm (1661-1733): Partita für Orgel: "Freu dich sehr"
In many of J.S.Bach’s cantatas, the use of flute in combination with soprano plays an important role. The occurs in small settings such as soprano, flute and basso continuo (as seen in the Easter Oratorio BWV 249/5), as well in larger ensembles (for example, one or more additional obligato instruments such as in the cantatas BWV 152/4 and BWV 146/5). 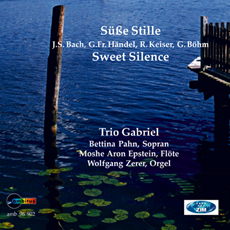 On this recording, the instrumental solos are played on the organ – a custom which we occasionally see in other works by Bach. The setting of the aria “I sow my tears” (cantata “Wir müssen durch viel Trübsal in das Reich Gottes eingehen” BWV 146) with four high voices (soprano, flute, two oboes) and b.c. is unusual for Bach’s cantata style and enables a myriad of sound possibilities, which Bach masterly used to demonstrate the text, to create musical dialogues and present the emotions of this cantata. Reinhard Keiser’s cantata “Laetatus sum” from the so-called Bokemeyer collection is his only composition for solo voice and b.c. The partita based on the chorale “Rejoice greatly, O my soul” by Georg Böhm is his most extensive work in this style. It is made up of twelve variations which Böhm creatively and diversely set. Typical for this is a broad stylistic spectrum, which also contains elements of both French and southern German music. The “Nine German Arias” by Georg Friedrich Handel are composed as a trio for soprano, solo instrument and b.c.. Handel’s musical language is distinguished through a close connection of text and music. The three arias presented here are very different in style, which Handel aptly portrays through his choice of tempi, time signature, key and use of rhetorical figurations.